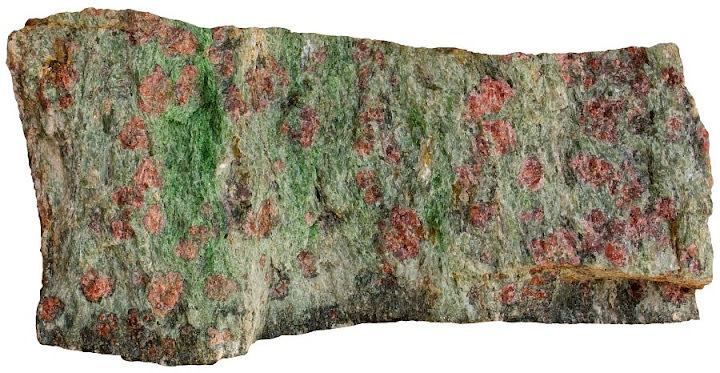 Eclogite is a metamorphic rock consisting of pyroxene omphacite and pyrope-rich garnet. It is a rare but geologically significant rock type. It is common in the upper mantle, especially in regions occupied by subducted oceanic plates. 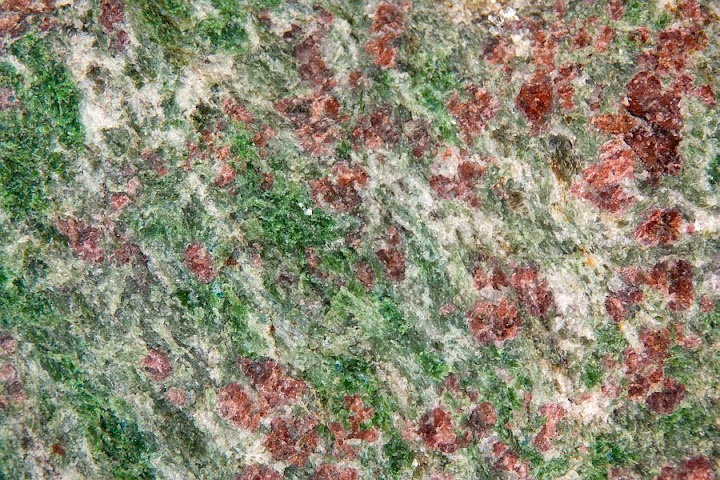 Eclogite is unusually dense for a silicate rock (3.4–3.5 g/cm3) which suggests that very high pressure was involved in the formation of this rock type. 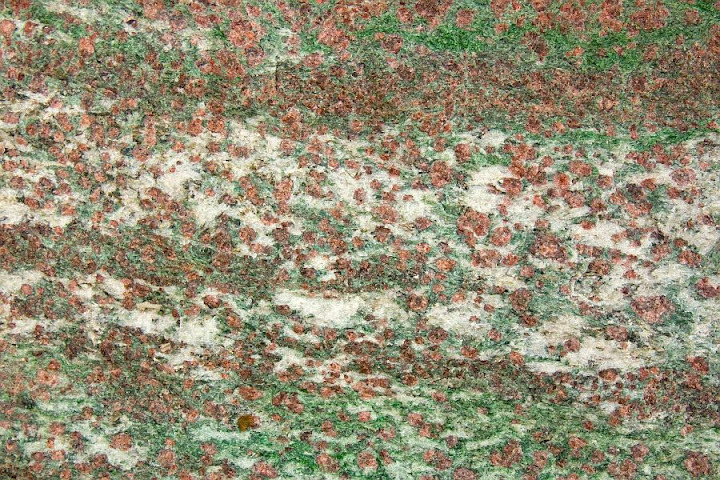 Eclogite is a very beautiful rock. 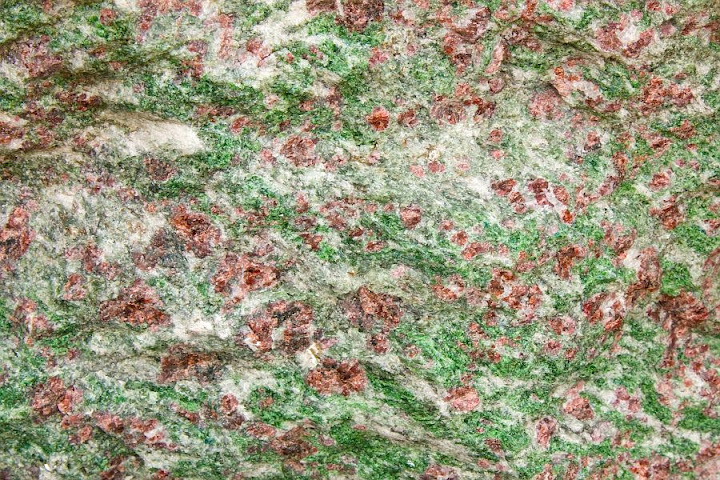 It is sometimes referred to as a christmas rock because of bright green, red and white minerals. Green is pyroxene omphacite, red is garnet, white is quartz. Nordfjord, Western Norway. Width of view is about 15 cm. 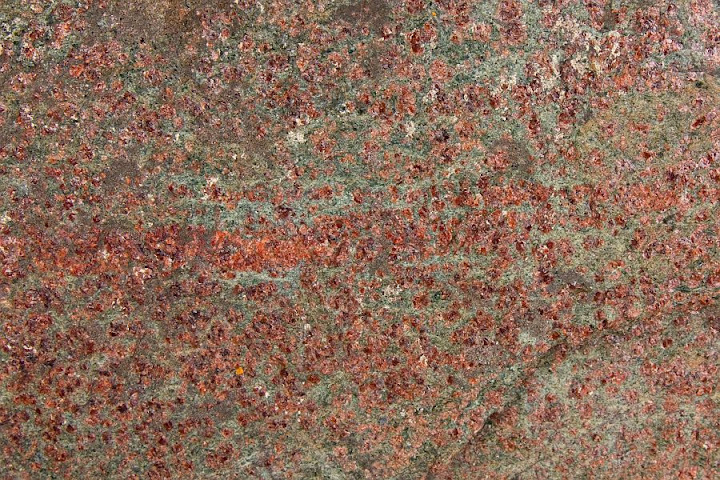 It is chiefly composed of red (garnet) and green (omphacite) minerals. 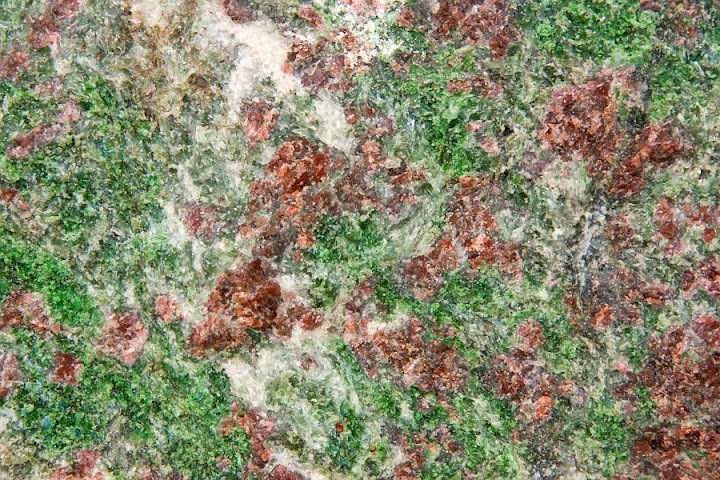 Garnet in eclogite is usually iron-rich pyrope (contains similar amount of Mg and Fe). Omphacite is a pyroxene group mineral with a composition in the middle between jadeite and diopside. Other minerals that may occur in eclogite are quartz, kyanite, amphiboles, orthopyroxene, olivine, mica, zoisite, and rutile. Eclogite may also contain kyanite (small blue spots, abundant but visible only if you look carefully (esp. in the lower left within green omphacite)) which is stable at very high pressures. Width of view 18 cm. Eclogite contains no plagioclase although its protolith is full of this mineral. The protoliths of eclogites are igneous rocks with a basaltic composition (basalt, diabase, gabbro). The lack of relatively light-weight plagioclase is the reason why it is so dense compared to its protoliths. That may look somewhat complicated but here is the same thing expressed in another way: plagioclase (first two formulas put together give as a plagioclase with a composition of labradorite) + olivine (Mg-rich variety forsterite) + diopside = omphacite (first two formulas are jadeite and diopside, respectively) + garnet (there is no such garnet group endmember as the formula suggests but I guess it was needed to make the equation work) + quartz. Real reactions in real rocks are no doubt more complicated and there are more components. Phengite (variety of muscovite mica) is a common constituent too (light brown reflective flakes). More mica in the composition of eclogite. Width of sample 10 cm. 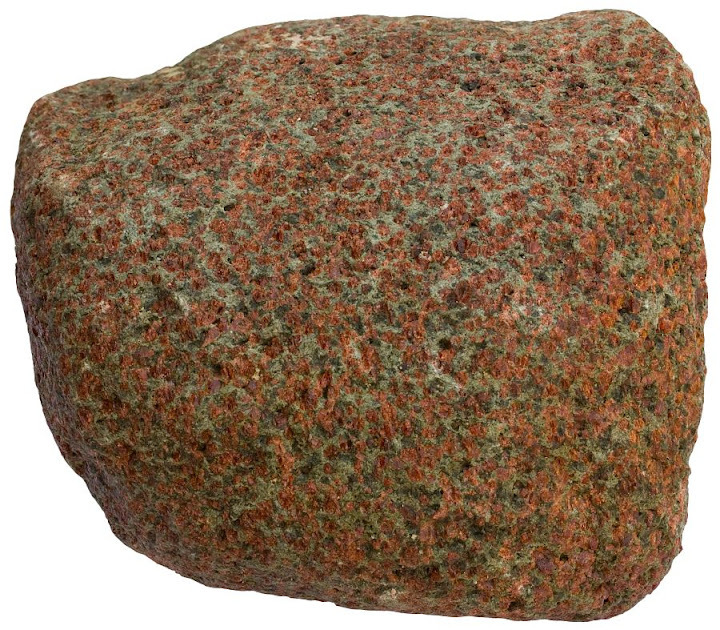 It is a rock type that gave name to a metamorphic facies. Eclogite facies is characterized by pressures in excess of 1.2 GPa (45 km depth) and temperature exceeding at least 400-500 °C. 400-500 degrees at 45 km depth is below the crustal average (25 °C per kilometer of depth). So the formation of eclogite rock takes place at relatively cool conditions which prevail at the subduction zones where cool oceanic lithosphere with a roughly basaltic composition sinks into the mantle. Where sedimentary rocks have been metamorphosed under eclogite facies conditions, schist or gneiss forms instead of eclogite5. Hence, not all eclogite facies rocks are eclogites, nor are all eclogites formed under the conditions of eclogite facies (some eclogites formed at the conditions of amphibolite or blueschist facies). 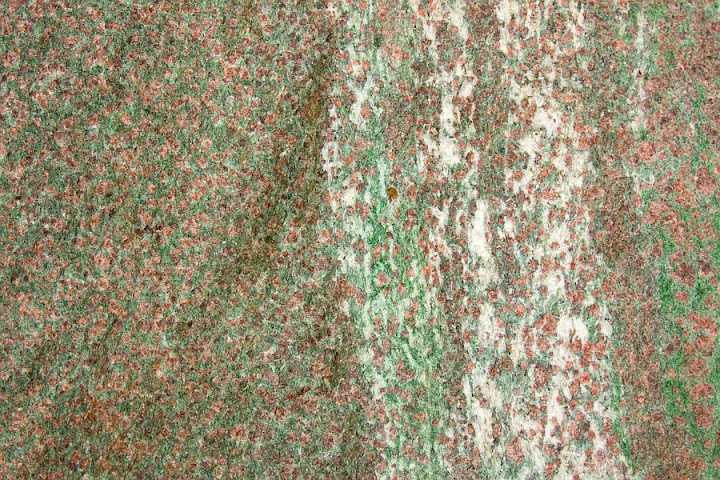 Eclogite is definitely a common rock type at deeper parts of subducting slabs and helps to keep the plate tectonic conveyor belt in operation by dragging down the subducting slab but it is rare at the surface. It is not very common for the rocks once buried that deep to somehow raise again to the upper parts of the lithosphere. Eclogites are found as xenoliths in volcanic rocks with a somewhat unusual alkaline character (alkaline basaltic rocks, kimberlite, lamproite, etc.). 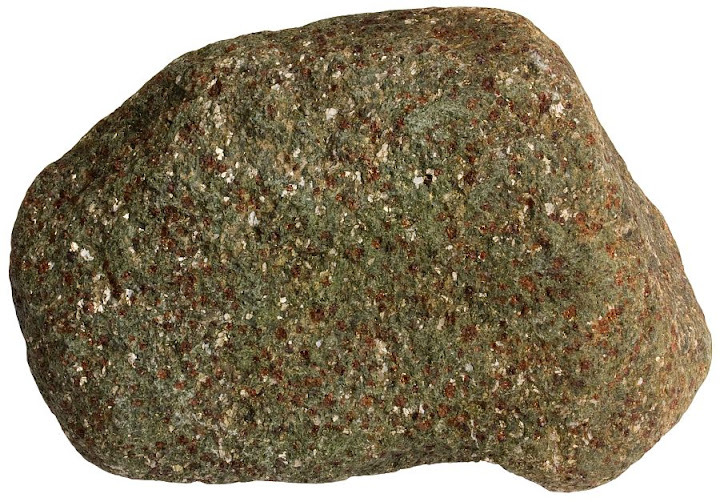 These rocks are frequently accompanied by xenoliths of garnet peridotite. Both peridotite and eclogite can be diamond-bearing, suggesting that they come from deep in the mantle where temperature is much higher than 400 °C (at least 900 °C)5. Larger masses of eclogite occur in exhumed oceanic lithosphere or as relict dikes or other basaltic intrusions within other metamorphic rocks. Low-temperature eclogites formed only in subducting slabs (blueschist or low-temperature eclogite facies)3. Three groups of eclogites are referred to as group A (former basaltic intrusions within metamorphic rocks of the amphibolite facies), group B (inclusions or xenoliths from great depths), and group C eclogites (former subducting oceanic lithosphere). Group A eclogites frequently contain quartz, kyanite, and zoisite. Kyanite seems to be absent in group C eclogites and quartz is rare. Group C eclogites bear amphiboles, epidote, and rutile5. 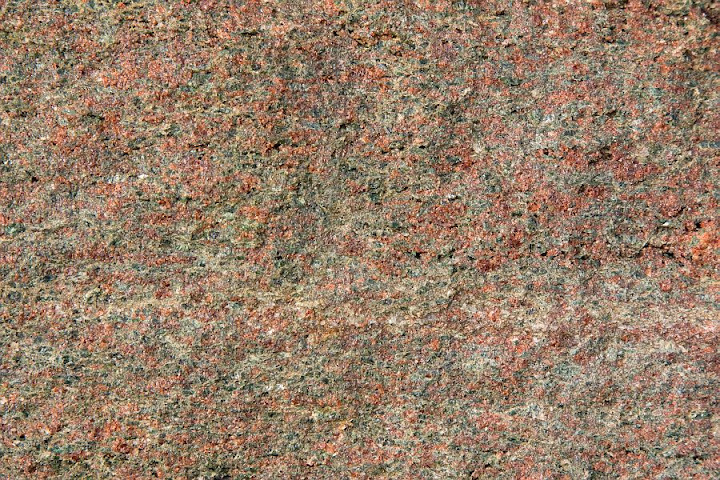 Eclogite may be more fine-grained and darker in appearance. This sample from Norway is mostly composed of amphacite + garnet. Width of sample 11 cm. 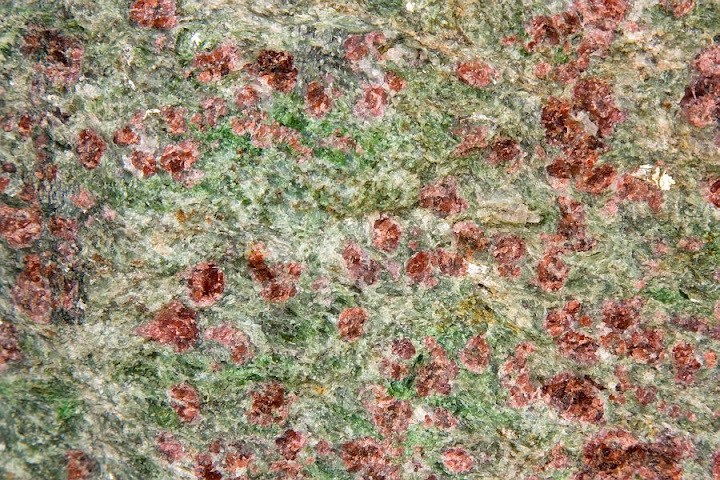 Garnet-rich eclogite sample. Width of sample 9 cm. Basalt metamorphoses to eclogite but is the opposite true as well: eclogite, if melted, yields basaltic magma? It turns out not to be the case. Peridotite yields basalt by melting partially. Fertile mantle (wehrlite or lherzolite) melts partially by giving away basaltic magma and transforming itself to harzburgite or dunite (depleted mantle). Eclogite, however, is already basaltic in composition. It needs to melt entirely to yield basaltic magma. This is not likely. Eclogite also melts partially but by doing that magma with a more evolved composition will form. Such magma is rich in plagioclase and crystallizes as granodiorite or tonalite. These are granitoids where the dominant feldspar is plagioclase. They are collectively known as TTG rocks (tonalite, trondhjemite, granodiorite). 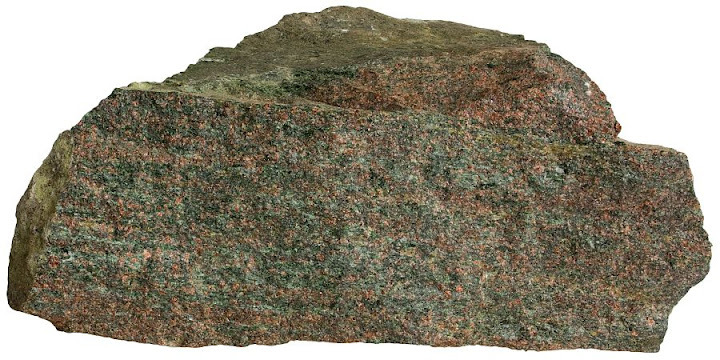 Granite can not form out of this magma because it contains little Potassium. The generation of TTGs during the Archaean marked the transition from a simatic (mafic) to a sialic (felsic) crust, and represents the magmatic contribution to the cratonization6. Hence, it is geologically hugely important rock not only as a contributor to the mantle conveyor belt but also as a source rock of the continental crust. 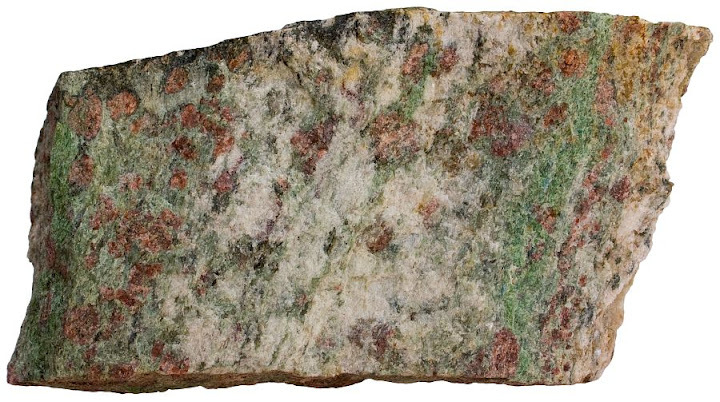 Eclogite as a rock type was first defined by a French mineralogist René Just Haüy in 18222. He used the term for a “fancy rock” composed mainly of two minerals “diallage and garnet accompanied accidentally by kyanite, quartz, epidote, and lamellar amphibole”4. Width of view 20 cm. Verpeneset, Norway. Width of sample 12 cm. Nordfjord, Norway. Width of sample 14 cm. Nordfjord, Norway. Width of view 20 cm. Selje, Norway. Nordfjord, Norway. Width of view 30 cm. 1. Deer, W. A., Howie, R. A. & Zussman, J. (1996). An Introduction to the Rock-Forming Minerals , 2nd Edition. Prentice Hall. 2. Tomkeieff, S. I. (1983). Dictionary of Petrology . John Wiley & Sons. 3. Best, Myron G. (2002). Igneous and Metamorphic Petrology , 2nd Edition. Wiley-Blackwell. 4. Smulikowski, K. (1990). Eclogite. In: The Encyclopedia of Igneous and Metamorphic Petrology (Encyclopedia of Earth Sciences Series) (Ed. Bowes, Donald). Springer. 684. 5. Holland, Timothy J. B. (2007). Eclogite. In: McGraw Hill Encyclopedia of Science & Technology , 10th Edition. McGraw-Hill. Volume 6. 41-42. Very nice topic i really got a lot of knowledge from . but seriously i think there’s a mistake in this line ( 400-500 degrees at 45 km depth is below the crustal average (25 °C per kilometer of depth). ) Asthenosphere at depth of 100 km and it’s temprature is 300-500 so how can be 400 degrees at 45 km depth only . It seems to be correct. 45 km depth is about 12 kbar of pressure. If you take a look at the metamorphic facies diagram: https://en.wikipedia.org/wiki/Metamorphic_facies then you’ll see that the temperature range 400-500 and pressure 12 kbar is in the lower part of the eclogite facies field. This is possible because geothermal gradient is much lower in subduction zones where cold oceanic crust is diving and takes lots of time to heat up. Thanks for the article of your share, it is very useful to me. :).